EUGENE, Ore. – Behind a pair of national runner-up performances from Sandi Morris and Dominique Scott, the No. 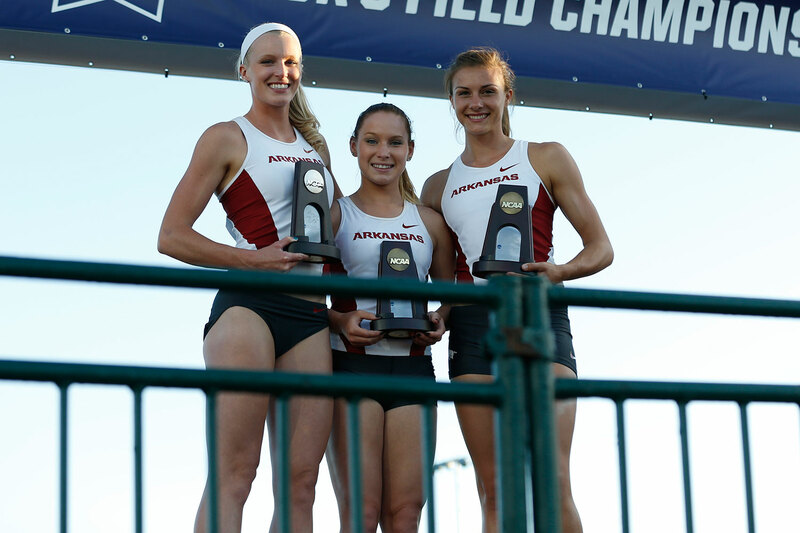 2 University of Arkansas women’s track and field team is in second place after day two of the 2015 NCAA Championships at Hayward Field. The Razorbacks scored 22 points Thursday toward their team total and collected three qualifiers for the championship round of events Saturday. Taylor Ellis-Watson – 400 Meters | 5:05 p.m.
Chrishuna Williams – 800 Meters | 5:20 p.m.
Dominique Scott – 5,000 Meters | 6 p.m.
Swinton/C. Williams/R. Williams/Ellis-Watson – 4x400m | 6:20 p.m.
Morris led a 2-5-7 finish in the pole vault with teammates Desiree Freier and Ariel Voskamp, respectively, which secured the team’s first points of the meet. In her final collegiate meet, Morris had a final clearance of 4.65m/15-3 to score eight points. She and champion Demi Payne of Stephen F. Austin both posted marks that surpassed the previous meet record. The Razorbacks also picked up points from Freier who equaled her personal best with a clearance of 4.35m/14-3.25 and Voskamp who scored for the second-consecutive year with a final clearance of 4.30m/14-1.25. While her teammates were racking up points in the pole vault, Scott ran to a second-place finish at 10,000 meters which added eight points to Arkansas’ total. She crossed the finish line in 33:25.81. Scott now turns her attention to Saturday’s final at 5,000 meters where she placed sixth at last year’s national meet. Diane Robison posted a top-15 finish as well in her 10K debut at the national meet. Taylor Ellis-Watson and Chrishuna Williams turned in a pair of qualifying performances in their respective events. Ellis-Watson finished seventh overall in the 400-meter semifinal to claim a spot in Saturday’s final while Williams kicked past the field to win her heat and secure a place in the 800-meter title race. Both runners were also part of Arkansas’ 4×400-meter relay with Brianna Swinton and Regine Williams that qualified for Saturday’s final. Alex Gochenour just missed her first national scoring position in the heptathlon. The Razorback junior finished tied for the eighth-place score of 5,806 points but dropped to ninth on the head-to-head tiebreaker. In her NCAA debut in the event, Taliyah Brooks moved to No. 4 in program history with her score of 5,717 points. She was aided by a personal-best effort of 6.28m/20-7.25 in the long jump which ties the program’s No. 3 all-time mark. The NCAA Outdoor Championships is more visible than ever before with 12 hours of television coverage on the ESPN family of networks during the week with additional online streams dedicated to the multi and field events. The women’s title race will be decided Saturday.